That's That...: Lil' Wayne - "Tha Mobb" X "Receipt"
Don't get me wrong, I'm not questioning Weezy's talent. Lil' Wayne's freestyles still have the potential to be right up there with nearly anyone else in the game (if you don't believe me, you need to give No Ceilings another listen). He isn't the "best rapper alive," as he so often claims, but he still possesses a great deal of talent. What has made Wayne's career start to circle the proverbial toilet is his decision to go pop. 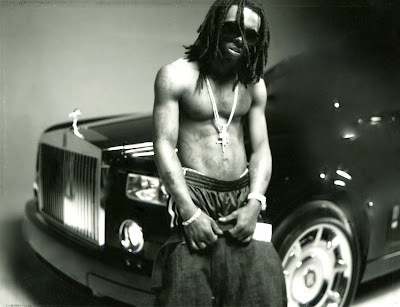 Auto-tune was fine at first when it was new gimmick, but once Wayne became reliant on it for every song forgot that his job as an emcee is to drop a solid 16 or two every song, Wayne lost all respect as a rapper. Wayne's obsession with being a rock star (or rather, the corporations' obsession with squeezing every penny they can out of a quickly vanishing commodity), has caused his health and critical acclaim to vanish at the same time that his wealth has skyrocketed. It's sad to see. The people around him keep enabling his addiction, supplying him with more and more drugs. It's like watching a NASCAR race, we all know the crash is going to happen, but we can't look away (in fact, it is the potential of the crash that keeps our eyes focused on him). But enough of the current Lil' Wayne. Before he released the absolutely atrocious Rebirth, he dropped The Carter II back in 2005. CII used to be an album that I could say was one of my favorite albums of the past decade, but it's been more difficult to voice this opinion with the recent stigma attached to Wayne. With the exception of "Fireman" and "I'm a D-Boy," I actually enjoy every track on the album. It's not Brother Ali. It's not Nas. Don't expect to hear much vocalized political dissent from Wayne. Instead, expect a talented, witty wordsmith who gives a fairly honest portrayal of his environment. Lil' Wayne was once an emcee that I respected, an emcee who was largely overlooked for geographical reasons. But I fear that Wayne has gone too far to be redeemed and will forever remain a shell of his former self. Still, we can take solace in the fact that we can still listen to his past witness and bear witness to what could have been.